WHO WAS THE GOD OF MOSES? Yahweh or El? Who is God to Moses? El, the supreme god of the Canaanites. 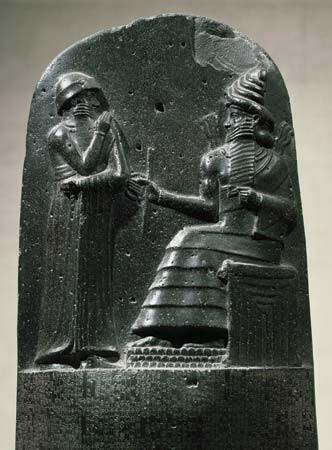 The top part of the Stele of Hammurabi shows the deity Shamash giving the laws to Hammurabi – an obvious parallel with Moses and the Stone Tablets of the Law. and there were still Israelite memories of El’s local manifestations such as Shaddai, Bethel, Elyon, El Roi, who had special sanctuaries/holy places. People at the time thought not only of a single god El, but in polytheistic (many gods) terms as well. For example, one of the major Hebrew historians (the ‘Elohist’ or northern historian), though he links El with Yahweh, still uses the plural form Elohim. He then complicates the issue by treating the word as a singular noun. This apparent contradiction reflects the transition from a belief in many gods to a belief in one. 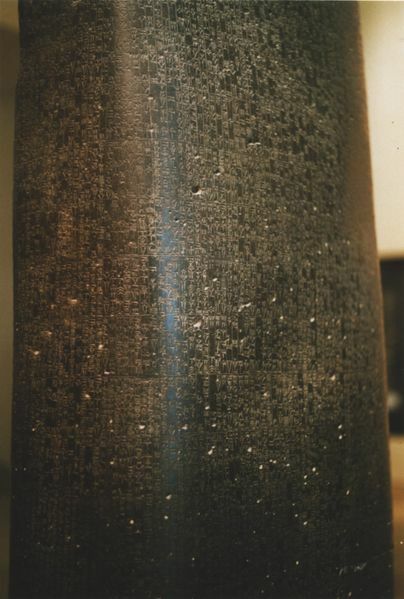 Laws inscribed on the stele deal mainly with contracts, and family and household matters. This was only one of many ways in which the Israelites continued to use Canaanite imagery to convey the might and majesty of their God. For example, they still saw him as a divinity of the storm (Hadad): and, more particularly, they took over the idea that he was the universal Father and Creator. Moses understood that this blend of the patriarchal and Canaanite ways of regarding deity required a new definition, so this God now became known under a different name. His designation, in the vowel-less Hebrew language, was YHWH. How the word was pronounced is not quite certain, because an aversion to uttering it developed, partly because of a feeling that YHWH was too sacred a word to utter. God himself, it was declared, had revealed his new name of Yahweh to Moses (see the story at Moses & the Burning Bush). This supposed revelation was the same as describing his real nature, since a name was thought to tell something about the person who owned it. This was important, because knowing the name of a god or spirit gave a person power. So when Moses knew Yahweh’s name, he and his people knew a secret which gave them special knowledge of Yahweh, and special power. It was ground-breaking stuff. A new name for a new god: this made the Hebrews’ god at least equal to the chief gods of the defeated Egyptians.